Kinder and gentler to skin. Clean and breathable. That's what mineral makeup is supposed to be about. No we haven't tried it yet. But some of our friends seem to love the loose powder foundations and blushes. Neutrogena always seems to be on the beauty forefront, and for a couple of months now, has been pushing its new Mineral Sheers Liquid Makeup. Neutrogena's Mineral Sheers Liquid Makeup ($13.99, drugstores, http://www.ulta.com/) comes ready with a silky brush for buildable coverage. Although it's in a liquid form, it is still light and airy, according to the brand. We love that it has an SPF 20. And it comes in a dozen shades, which is pretty generous. You have quite a range to select from. There are also foes of the mineral makeup boom. Some women swear this makeup actually accentuates fine lines and wrinkles. And there are those who say their acne got worse after wearing this kind of makeup. We like to say that everyone is an individual. What works for you, might not work for her, and so on. We have one friend who works out hard four days a week, and she wears mineral makeup to the gym. She says the foundation hasn't failed her yet. It stays on throughout her exercise routine. 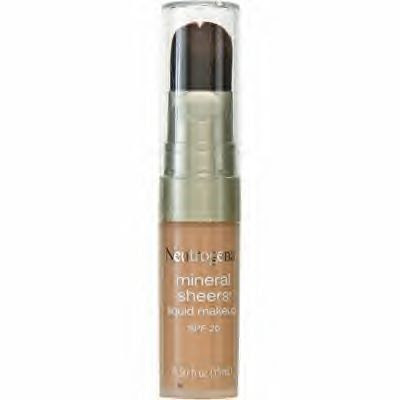 We are going to try the Neutrogena Mineral Sheers Liquid Makeup in a few weeks. We are attracted to the liquid foundation aspect of it. We hope it glides on easily and mattes our oily skin.